Croatia defeats England 2-1 in extra time to advance to the World Cup final vs France. US stocks ended the session lower. Wholesale trade sales were up 2.5% which was much better than expected. Wholesale PPI data was also stronger than expected. If growth remains strong and pipeline costs rise, that could trickle to the consumer prices as well. Plus, if all imports from China are to have a tariff slapped on it, that will push prices up as well. CPI data tomorrow. Emerging markets feeling the heat from a stronger US economy. Trump met with other NATO leaders and not only complained about not putting up 2% of GDP to defense but proposed 4%. I can't see how that might be net good for global economies to ante up more money. They can't even get to the 2% water mark. The US also announced that they are looking to impose tariffs on $200B of China goods and the markets weathered that storm. Yes stocks were lower but the broad indices ended on the bottom half of the range, but comfortably off the lows. Helping was risk off flows out of AUD and NZD. The AUDUSD fell early in the session on the news of the $200B China tariffs and continued the march below the 100 hour MA (at 0.7430), the 200 hour MA (at 0.74035) and to a low of 0.7363. That was just above the July 5th low at 0.73606. The NZDUSD stalled in the NY session at the 200 hour MA (at 0.6785 area), but after a corrective move to old floor support (now ceiling resistance) at 0.6805, the pair fell through the 200 hour MA and tumbled to a low of 0.6754. The 61.8% of the move up from the July trading range comes in at 0.67523, and seemed to slow the fall. 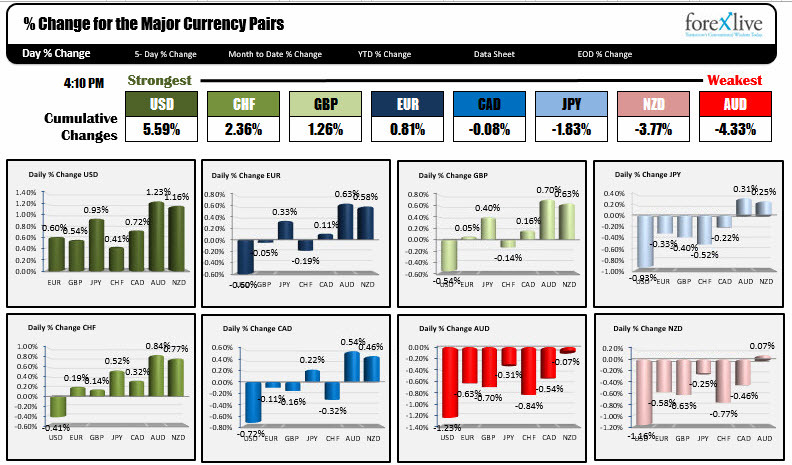 Looking at the snapshot of the strongest and weakest, the AUD and NZD currencies led the majors to the downside (with the AUD the weakest). 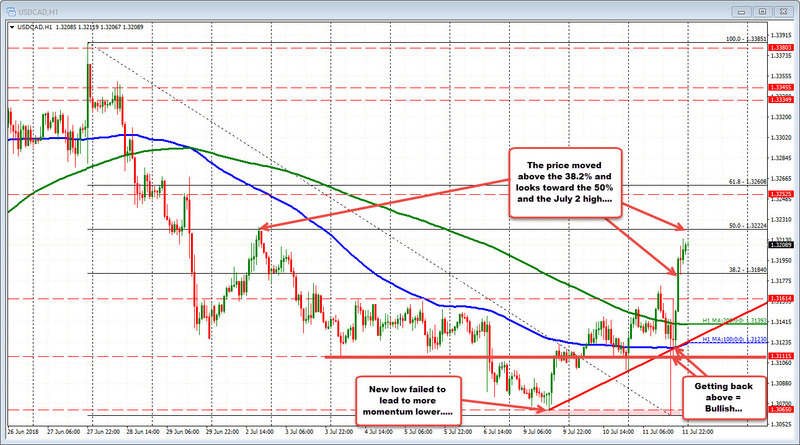 The USDJPY broke higher and traded at the highest level since January 10th. The run higher took the price above swing levels from December and May at 111.39-477 and above the 112.00 on its final run higher (the high reached 112.167 before settling the day around the key 112.00-05 area (see post here). And then there was the CAD. The Bank of Canada raised rates by 0.25% to 1.5% (as expected) and said that rates would continue to rise at a gradual pace as well. That sent the USDCAD down to test the Monday low at 1.3065 (higher CAD). However, after taking out the low by about 5-6 pips, the buyers started to nibble Oil inventory data - which showed a much larger than expected draw - failed to send oil prices higher (oil ended down -5%). That did not help the CAD bulls. They were forced to cover. Technically, the price moved back above the 100 and 200 hour MAs at 1.3122 and 1.3139. That attracted more buyers. By the end of the day, the price traded up to a high of 1.3210 - the highest level 8 trading days. The World Cup final is set with Croatia vs. France after Croatia defeated England 2-1 in extra time.